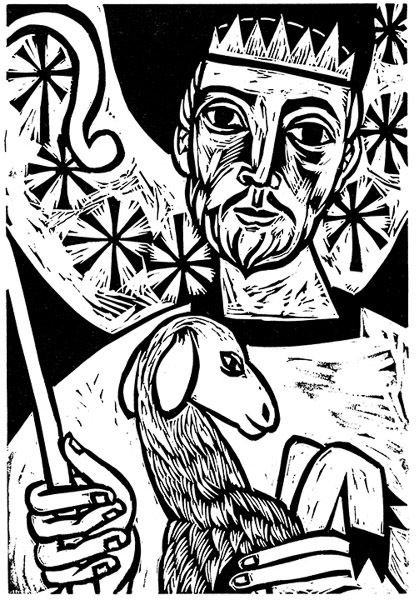 Tanja Butler: Shepherd King, linocut. Tanja Butler was born in Germany in 1955 and moved to the United States as a young girl. She studied art history and studio art and received a graduate degree in painting from the University at Albany, New York. She is interested in the intersection of art and worship. Periods of work in Italy shaped her understanding of ways in which visual art can support the ministry of the church. The frescoes by Fra Angelico in the convent of San Marco in Florence were a particularly influential model. Until 2014, when she retired, she was Associate Professor of Art at Gordon College in Wenham, Massachusetts, where she taught Painting, Printmaking, Illustration, and Liturgical Art. Students in her classes have created artwork for area churches, schools and community organizations. Her work has been displayed in many solo and group exhibitions across the United States. For more about Tanja Butler and her work, see www.tanjabutler.com.